Maintaining changelogs can be time-consuming, especially when multiple persons work on the same project. If you maintain a separate file, merge conflicts and additional release work is sure to follow. Sometimes complete entries are lost during merge conflict resolution, people forget to mention something or links between issues and actual commits are missing. It would be great, if we could use the commit history of git to generate a beautiful changelog without any additional work needed. This is where git-journal jumps in. To ensure this auto-generation a framework to write more sensible commit messages is needed. Single commit messages should contain one logical change of the project which is described in a standardized way. This results in a much cleaner git history and provides contributors more information about the actual change. After adapting your $PATH variable to search also within ~/.cargo/bin it should be possible to run it by invoking git journal. 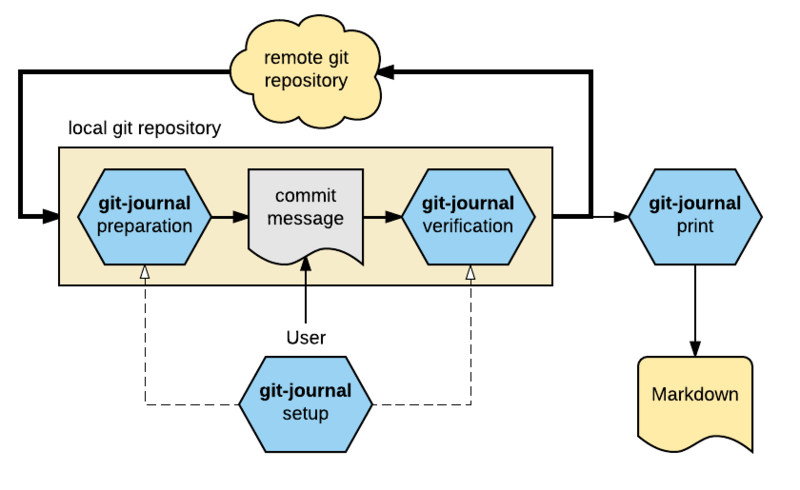 The binary git-journal depends on the Rust library gitjournal, which also can be used independently from the binary application to write customized solutions. This repository will be used as an example for the following explanations. All commits are sorted by time, which means that the newest elements occur at the top. The parsing of the commit message will be done regarding RFC0001, which describes the different syntax elements within a commit message. Categories ([Added], [Fixed], ...) are automatically wrapped in square brackets if available. It is also possible to define own categories within the configuration file. 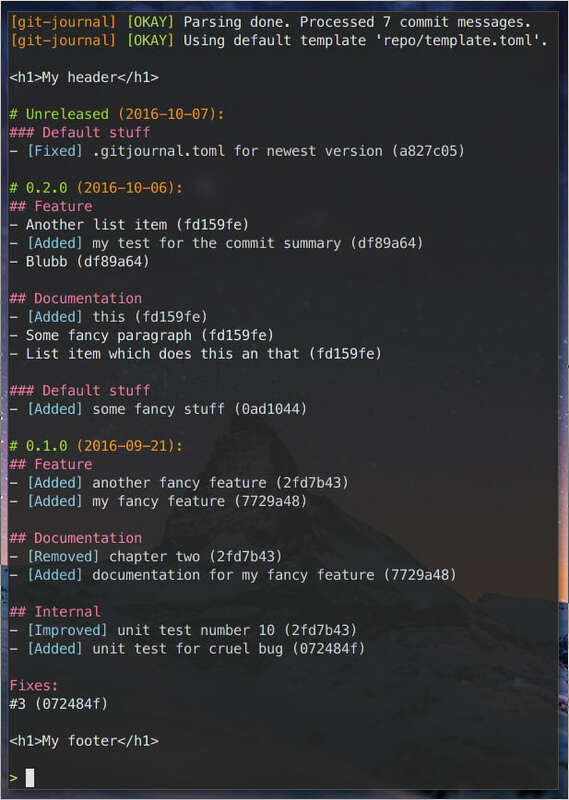 The journal automatically lists the log from the last release and the unreleased entries. It also possible to append the output of the journal to a file (-o), which will be separated by a newline (---) for each git journal invocation. Git tags with a specific patterns like rc will be excluded automatically, which can be customized via -e.
For more information please refer to the help git journal -h.
Everything which is untagged will go into the default section. The name of tag1 will be mapped to Section 1 and tag2 is a subtag of tag1 (see the markdown header). This also means that it is now possible that list items are uncategorized since the templating engine gives the possibility to split commits into multiple pieces. Parsed paragraphs are converted to single list items to always provide a clean markdown. The footers are specified as an toml array of strings which will output the selected footer keys at the correct position of the log. Please consider that the accumulation of the footers are related to the complete tag, not just the section where there printed. Other command line options like in the default output are available as well. It is also possible to add a custom header or footer text to every output or every tag. For more information please read RFC0002. [git-journal] [OKAY] Defaults written to '.gitjournal.toml' file. [git-journal] [OKAY] Git hook installed to '.git/hooks/commit-msg'. [git-journal] [OKAY] Git hook installed to '.git/hooks/prepare-commit-msg'. [git-journal] [OKAY] Installed bash completions to the path. [git-journal] [OKAY] Installed fish completions to the path. [git-journal] [OKAY] Installed zsh completions to the path. If there already exists these hooks git-journal tries to append the needed commands, which has to be verified by hand afterwards. The generated command line completions for bash and fish needs to be put in the correct directory of your shell. The default configuration file is a toml file which represents this structure. A default configuration with comments can also be found here. > git commit -m "This commit contains no cactegory"
> git commit -m "Added my_file"
[git-journal] [OKAY] Commit message prepared. [git-journal] [OKAY] Commit message valid. [git-journal] [WARN] These tags are not part of the default template: 'tag1'. [git-journal] [ERROR] Commit message invalid: GitJournal: Verify: Not all tags exists in the default template. Generation of completions for bash, fish and zsh shell during setup. Custom category support for commit preparation, validation and output (categories). Automatic multi threading support for the parsing. Automatic up-level repository search if a sub path of a git repository was specified. Custom commit ranges or different git commit starting points for parsing. Run in a different specified path than the current working directory (-p). Parse and print the complete history (-a) or the past n releases (-n). Print a short version of the commit history based on the commit message summary (-s). Output the parsed log in valid Markdown to the command line or a file (-o). Custom git tag exclude pattern, e.g. rc tags (-e). Enable/Disable debug message output (enable_debug). Enable/Disable colored output via the command line (colored_output). Automatic wrapping of commit message categories in square brackets. Templating support including tag and name mapping (default_template). Support for accumulating footer data (also for templating engine). Different sorting methods ("date" and "name") for the default and template based output (sort_by). Support for custom header and footer fields within templates with multiple or single output. Generation of default templates based on the parsing results (-g). Commit hash links for commits in standard and template output (show_commit_hash). Support for custom category delimiters (category_delimiters). Automatic installation of git hooks inside the local repository. Generation of default configuration file during setup. Commit message validation based on implemented parser. Message preparation with custom commit prefix (template_prefix). Differentiation between amended and new commits. Use the tags from the default template for the commit message verification. There are no bigger features planned yet.